The cicada was also a popular motif for the snuff bottle, often dictating the entire form of the bottle (see Sale 4, lot 22), but also used as a decorative motif. This unique design bridges the gap between the two. 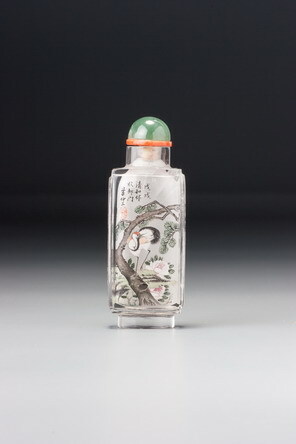 The shape of the bottle is dictated by the shape of the cicada, although adapted for formal purity, but it is not a cicada-form bottle, since there are two insects involved, each viewed from the same angle, looking directly at the back of the insect. These are then joined at the edges of the wings, and metamorphose at the juncture of the two heads into a decorative border design. It is also a bizarre creature by normal standards because the head has a distinctly animal nose, resembling a taotie, although a clue to the meaning of this strange combination is offered by the fact that the two formalized ‘C’ curlicues on the back of the head extend into long, curving, horn-like extensions, giving the head a dragon-like appearance. The material here is flawless and comes close to the ‘pure white’ that is claimed, somewhat euphemistically, for so many white nephrite bottles. In fact, nephrite is never as white as chalk or a sheet of white paper and nearly always has a slight greenish or greyish tinge when compared with either. This bottle has a combination of modelled surfaces and incised lines which are ideally balanced. It is a ‘secret’ bottle, the design and meaning of the form being almost completely lost to view other than at close range. In the hand, however, it comes to life as a superbly controlled masterpiece of understated jade carving, with perfect formal integrity and fluid and confident carving of an intriguingly individual and imaginative design superimposed upon a flawless and delightful material.